Habitability Whether Rocks Weather or Not? Habitability is a far more complex question than “How far is a planet from its star and how bright is the star?” Insolation (the amount of energy received from the star) is an important factor, and the first step in determining the habitable zone around a star, but many, many factors contribute to how that insolation translates to habitable temperatures on a planet’s surface: geologic activity, atmosphere, surface albedo, or even tidal forces. Many estimations of the habitable zone count on atmospheric CO2’s ability to keep a planet warm, along the lines of the greenhouse effect. On Earth—barring human intervention—this effect is regulated through the carbon-silicate cycle, a feedback effect that keeps Earth’s climate steadily hospitable to liquid water (and thus to life). The assumption of this effect on Earth-like exoplanets has been taken into account in definitions of the habitable zone. However, as today’s paper suggests, this “climate thermostat” may be much less effective on planets with lower insolation. We may be drawing the outer edges of the habitable zone too far. Habitable zone estimations that take this regulation into effect assume that it would work on Earth-like planets much the same as it does on Earth. Today’s paper looks at the fact that, on Earth, vascular land plants are an impediment to rock weathering. Without that effect, does the carbon-silicate cycle still keep the habitable zone nice and wide? In the absence of land plants, the rate of weathering is determined by how much CO2 is in the atmosphere. The author of this paper, Dr. Menou (a former professor of mine), models a slightly simplified version of the carbon-silicate cycle (discounting what goes on in the ocean, basically). He uses this model to assess if an increased dependence of weathering on atmospheric CO2, as would be seen on a planet without plants on land, can still allow for stable, habitable climates. When the weathering rate is independent of CO2 levels in the air, the models show two climate/weathering solutions at which insolation and radiative cooling—heat in vs. heat out—balance: at 288 K, which is Earth’s current climate, and at 229 K, where the whole planet is frozen. But when the weathering rate depends on CO2—i.e. it is unmediated by surface plants—the only points of equilibrium are above freezing. At low enough levels of insolation—1.25 AU from a sun-like star—weathering that’s strongly dependent on CO2 levels entirely eliminates the possibility of a climate in equilibrium. Instead, planets at the outer edge of the habitable zone go through dramatic climate cycles over tens or hundreds of thousands of years. Most of the time is spent frozen, but CO2 released from volcanic activity gradually builds up in the atmosphere, until it triggers a brief defrost. But as soon as the planet is out of deep freeze, water facilitates weathering, and it’s back to a cooling trend. Figure 2. 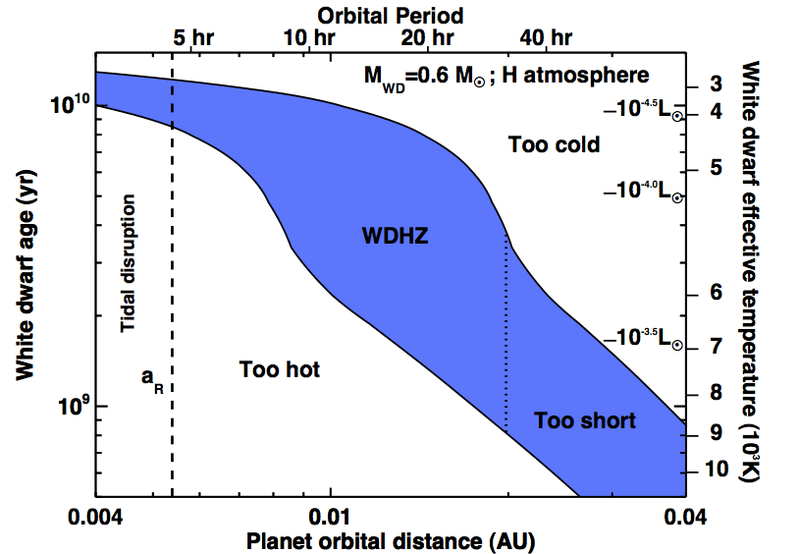 Two of the climate cycle scenarios for planets in the outer reaches of the habitable zone. The upper graph shows the temperature cycle; the lower graph shows the cycle of CO2 levels in the atmosphere. These findings raise a chicken-or-egg question about the evolution of alien life. If, on some planets, land plants are required for a stable, temperate climate, but liquid water is a prerequisite for most life… maybe we’ve been drawing the habitable zone a little too optimistically wide. Menou find that the lack of vascular plants to slow down weathering impedes the build-up of atmospheric CO2. On a weakly-insolated planet—either orbiting a dim star or orbiting too far away—this may render the carbon-silicate cycle ineffective. 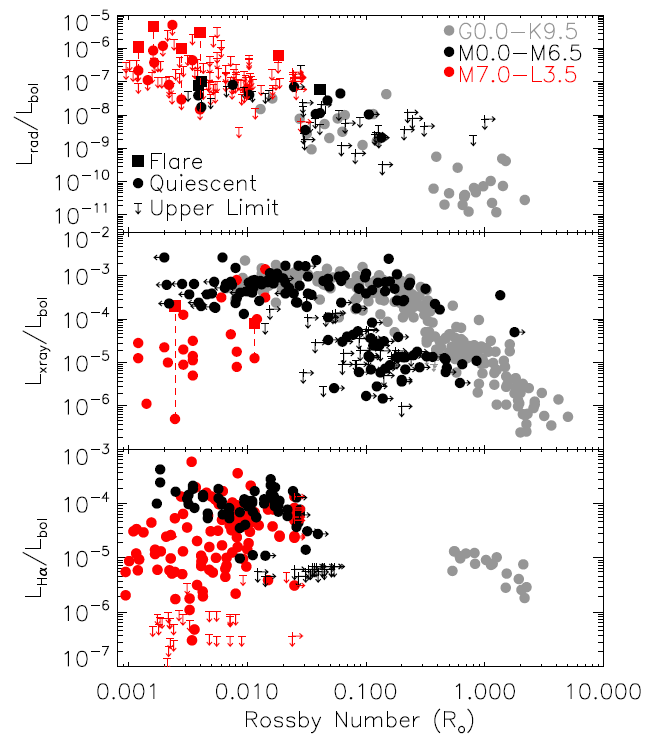 Detecting Transiting Planets Around White Dwarfs The Radio Activity-Rotation Relation of Ultracool Dwarfs How Hot is Too Hot? 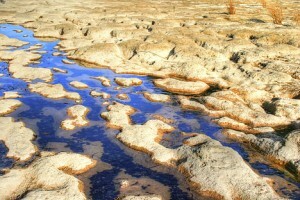 Are Extrasolar Worlds More Likely to Be Water-rich? 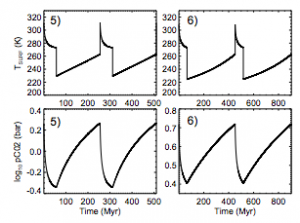 Could accounting for the carbon-silicate cycle affect the inner bound of the habitable zone? For example, could trapping more carbon keep a closer planet cool? I am wondering about our assumption that the carbon-silicate cycle is translatable to exoplanets in large number. Do we anticipate finding / have we already found exoplanets with both water and volcanic activity?